Ecologists - especially systems ecologists, theoretical biologists, environmental scientists, faculty, graduate students and advanced undergraduates in the ecological and environmental sciences. Resource economists, land management professionals and related audiences are also likely buyers. 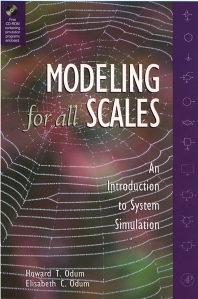 Part I: Modeling: Modeling and Simulation. Energy Systems Diagramming. Numbers on Networks. Part II: Simulation: Simulation with Picture Blocks. Simulation with General Systems Blocks. Equations with Diagrams. Calibrating Models. Simulating with Spreadsheets. Programming in BASIC. Simulating with STELLA. Simulating Energy and Transformity. Part III: Fundamental Minimodels: Suggestions for Simulation. Models of Production and Recycle. Models of Growth. Models of Competition and Cooperation. Models of Series and Oscillation. Minimodels of Succession and Evolution. Models of Microeconomics. Models of Macroeconomic Overview. Models of International Relations and Trade. Models of the Global Geobiosphere. Part IV: Application: Modeling Projects and Complexity. Simulation Approaches. Appendices: Programming Blocks for GENSYS using EXTEND. Notes on Computer Use and BASIC Programming. Answers to Questions. Use of Energy Systems Symbols. Contents of the CD with this Book. References and Suggested Readings. Tables. Legends. Figures. Howard T. Odum is the recognized originator of the systems approach to environmental and ecological modeling The recipient of many awards, his students and close colleagues now represent the leading proponents of systems science. Santa Fe Community College, Gainesville, U.S.A.